A military wife's journey towards self-sufficiency. March is the month where two of my cooking challenges collide. The March Food52 Cookbook Club book is "Deep Run Roots." 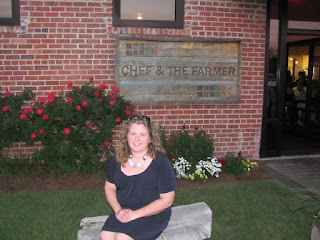 I've been cooking through it for awhile now with my friends back in VA.
Two years ago, before we moved to Guam, we celebrated my birthday with a road-trip to Kinston, NC and ate at "The Chef and the Farmer" and also "The Boiler Room". It was one of those memories I will never forget. I had watched all of the episodes of "A Chef's Life" on PBS and felt like I knew Vivian. Her food was amazing. So of course, when she came out with her first cookbook, I had to have it. My friends and I have been tackling the chapters one at a time, saving the summer foods for, well, summer. February was "Ground Corn" month and so I chose to make the "Pimento Cheese Grits with Salsa and Chips" (you can find a similar version of hers here). 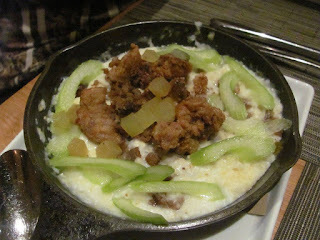 I'm a New England girl, y'all... the first time I ever had grits was at the Chef and the Farmer and no one was more surprised than I was when I absolutely fell in love with the 'Dirty Grits' with sausage and chicken livers (pictured above). I promise that I speak the truth when I say that I intended to make the pimento from scratch, from the recipe that is also in the book. I have a jar of pimentos in my pantry to prove it. But really, now... did I honestly think the Commissary here would carry white cheddar? When I saw the $1.50 container of ready-made pimento cheese, I grabbed it. I started out with the grits in a homemade double-boiler. After the recommended time, they still hadn't really thickened, so I put them directly on the heat and that did the trick perfectly. I transferred them to a cast iron pan and dropped spoonfuls of pimento cheese on top, then spread it (do not try the wax paper tip from Vivian with store-bought, it's too sticky and wet to roll out) and popped it in the oven. At this point, it was time to make the 'salsa'... which I would call more of a pico de gallo. The 'tomatoes' we get here are notoriously awful. Barely orange on the shelf, refrigerated, and don't even think about letting them ripen because they'll be a soft mess in about 12 hours. But I bought a couple just for this recipe, chopped up some purple onion, threw in a couple of frozen cilantro/evoo cubes, and called it good. The cheesy grits came out of the oven as bubbly goodness and I added the salsa on top. It just seems wrong, but I served it with "Hint of Lime" chips (our favorite), and called the family to try. We literally stood at the counter, scooping directly from the hot pan on the stove until the bag of chips was almost gone. It was truly that good. Even the picky 13 year old scooped around the onions and wolfed it down. I will say it's better served warm than cold, but that didn't keep me from finishing off the leftovers straight out of the fridge. This would make a great appetizer, assuming you are hosting the party and can serve it warm, or you know your hostess well and can heat it in her oven before serving. I don't think it would travel well after cooking. The next time I make it, I think I will only use half of the grits called for (or double the salsa) because I think I would prefer that ratio better. But none the less, this one is another winner. I need to make an effort to clean out the fridge and freezer. Both of them are too full at the moment. So I grabbed a ball of pie dough from the freezer and the jar of local-lemon juice that's been sitting in my fridge for the past month (remember this?) and decided to try my first ever lemon meringue pie. I love lemon desserts, so I'm not really sure why I've never attempted one before. May be I was a tad intimidated by the meringue. I followed Kate's recipe (not for the pie dough... I'm still waiting for my order of leaf lard to be delivered and I had that ball in the freezer so I couldn't justify making more...) and it worked just perfectly. The only change I made was that I did not have any lemon zest, so I added in a bit of homemade lemon extract instead. The struggle was waiting for it to cool completely before cutting in to it. It was a long, hard wait. It was real good, y'all! When I can get my hands on more calamansi, I'm going to try that instead of the lemon. Kate, you're killing me here. I do not have the room on my shelf for another cookbook! (I know Kindle is an option but when it comes to cooking, I want the real thing.) I still have one more ball of dough in the freezer and a can of pumpkin in the pantry, so I might have to be the only person who bakes pumpkin pie in February. And hopefully the lard gets here soon because I really want to try the Chicken Pot Pie. Last week, I happened to stumble upon a new Facebook site called the Food52 Cookbook Club. Basically, every month they pick a cookbook and cook from it. This month's pick is The Art of Pie by Kate McDermott. Now, I have been stingy lately when it comes to buying new cookbooks. I sifted through A LOT of them before we moved to Guam and donated about 75% of my collection (they are heavy, and we have a weight-limit when it comes to moving). I vowed that I would become much more disciplined when it came to adding any more to my collection. Since then, I've only purchased 2 of them... Vivian Howards "Deep Run Roots" was a no-brainer because I love her show, I ate at both of her restaurants, and I knew it would be worth having. I also bought Alana Chernila's "Homemade Kitchen" because I had her first cookbook and really liked it. All that to say I do not plan on buying all of the cookbooks that the Cookbook Club works through. I do, however, plan to try as many recipes from those cookbooks that I can, relying on library downloads to my kindle and also online sources for recipes. When I cook enough to determine the book can hold its own, I may buy it. Fortunately, Kate McDermott's website has several pie recipes (you can find them here.) Unfortunately, many of them call for leaf lard for the crust, which is just not something that is readily found in this tropical paradise. So I decided to start with the "Cottage Pie" recipe because I knew all of the ingredients could be easily found. I anticipated push-back from the family. First of all, my husband will not eat Shepherd's Pie and this isn't all that different. Secondly, the eldest daughter despises onions and, well, anything new. But I am desperate for new dinner recipes (I feel like I've been in an 18-month rut, since moving here totally changed how and what we eat) so I persisted. I loved that I could assemble this ahead of time, prepping before the 'witching hour' when kids were home from school, whining about homework, and underfoot looking for snacks. I grumbled at having to lug the food processor out to shred the carrots, but then realized I also had to use it to shred the block of cheddar so it kind of felt like I was killing two birds with one stone. Half and hour before we wanted to eat, I threw the pan in the oven. Complaints from the eldest ensued, even after I explained there wasn't actually any cottage cheese in the Cottage Pie, but she didn't want to make her own salad (the only other option we give them when they don't like what's put in front of them) so she begrudgingly filled her plate. The husband said "This is tasty." So of course I had to ask him why he'd eat this and not Shepherd's Pie. His answer? This has cheesy potatoes and carrots instead of corn (which he eats alone but not mixed in anything else.) The eldest child picked out the onions and ate everything else... and went back for seconds. The youngest child claimed the leftovers to pack for lunch tomorrow. And in a blink, the entire pan (which is supposed to serve 6-8) was empty. If you would like to give it a try, here's the recipe. Completely Lepper Colony approved. Next up, I may try the lemon meringue pie since I have some juice of local lemons in the fridge. "The Art of Pie" is getting great reviews on Amazon, and so far I concur! Unlike many beekeepers who will not admit to their short-comings, I guiltily admit to neglecting my girls. Torrential downpours and tropical heat do not make for ideal hive-checking conditions. This morning I went for a walk after I put the (human) girls on the bus and it was one of those rare days when it was almost... dare I say... pleasant. So I vowed when I got home I would don the jacket, fire up the smoker, and say hello to the bees. I did not bother to look for either queen because both hives had eggs and larvae. But the most exciting thing for me was finding a full frame of capped honey. Checking to make sure I wasn't depleting their stock, I put that frame aside and closed up shop before they got too mad at me. Back in VA, it was easier to rob the bees because we'd do it a box at a time, using special (but safe) fumes the bees didn't like. They'd hunker down in the lower part of the hive, we'd lift off the box of honey, and off we'd go. This morning, I had to brush the bees off the frame, walk away from the hive, brush some more bees off, walk further away, brush more bees off... you get the picture. Only when I was satisfied that all bees were off the frame (and my jacket) could I take it inside. I never imagined I'd have bees in Guam, so I left my Extractor in storage. I wouldn't have used it for just one frame, anyway, because it makes a mess and wouldn't be worth the hassle. Instead, I resorted to the age-old practice of 'crush and strain', which is exactly what it implies. You take the wax off the frame, crush it, and strain it to remove any 'impurities' (like bee legs or larvae). Obviously, this means the wax is destroyed. Had I used an extractor the whole frame could have gone back into the hive for the bees to fill again. But that's ok. Bees are busy and they'll make more. And the wax certainly won't go to waste. I'll clean it, melt it, and use it in my salves and soap-making. Voila! One full quart of honey and about 3 more cups in the bottom of the bowl.,, about 84 oz of honey. Here in Guam, the going rate is $20/lb, which means I just harvested $105 worth of honey. NOT THAT IT'S FOR SALE. Because it isn't! It's been 18 months since we made the move to Guam and I am not canning nearly as much as I did in VA. I've made a lot of Mango and Guava jam for Christmas gifts, but I miss hearing the ping of sealing jars on a regular basis. So when I heard about the Food In Jars Mastery Challenge, I knew I had to take part. Basically, each new month is an opportunity to work on a different food preservation technique or skill. January's topic was MARMALADES. Now, I'm not one of those people who dislike marmalade, but I'm not going to go out of my way to get my hands on it. And I certainly have never taken the time to make it, because unless I can get local, spray-free citrus, I'm not real interested... unlike most Navy families, we have never lived in Florida or California! When one lives on Guam, however, the first thing that pops into your head when you hear 'local citrus' is Calamansi. I'd never heard of it before I came here. In other parts of the world, it is called Calamondin (I've also seen both words spelled with a 'k'.) It's a small lemony-limey type citrus fruit most often juiced for a drink similar to lemonade. I don't like to drink my calories (I eat more than enough of them as it is!) so I've never tried it, but I know many friend who enjoy it. So, my reasoning went, if people enjoy the taste enough to drink, certainly it should make a good marmalade. An on-line search revealed that calamansi marmalade is, indeed, a 'thing', so I decided that's what I was going to make. When I asked a group of friends where I could get my hands on some, they all said "Call Sabrina! She's got a ton!" So I did, and she had just enough left to give it a go. (She'd foraged them from a tree on the side of the road. I knew they were organic!) Well, I followed the directions perfectly and I ended up with the most bitter-tasting, disgusting product to ever come out of my kitchen. I am really good at 'saving' jams that don't come out as expected, but there was just nothing I could do with this stuff. Then I got to talking to my friend Susan, whose in-laws have a farm here on the island. "Are you SURE you were using Calamansi and not local lemon?" she asked. Um, not really! A couple days later she presented me with 3 different kinds of Guam citrus. She was right... my calamansi marmalade wasn't calamansi at all! On the left are the fruits referred to as 'local lemons'. I have no idea what the rest of the world calls them, if they even grow in the rest of the world. In the middle are the calamansi, which you can see are much smaller (they will turn orange if left on the tree, but the locals here consider them gone-by at that point.) On the right are the local tangerines, very similar to clementines except they have a green skin and a white flesh, and aren't quite as sweet. I immediately got to work on my second attempt at marmalade, this time using true calamansi. I used this site as my guide. I started with about 4 cups of fruit. I washed them and then cut them in half, taking out the seeds and slicing them (trying to save as much juice as possible.) I figured out too late that it was probably easier to get all the seeds out by cutting along the 'equator' of the fruit instead of from pole to pole. This gave me 2 cups of fruit, which went into a pan along with 1 1/2 cups of water. I let that simmer for a good 20 minutes to soften the skins. This is also a great time to remove all of the seeds you missed! Once cooled, it went into the fridge overnight to help develop the natural pectin. The next day, I added an equal amount of sugar and let it boil until it got to 220 (which didn't take nearly as much time as it did when I used the local lemons, which surprised me). Normally, I use half as much sugar as fruit in my jams, but this is not the time for that. First of all, the sugar is needed for taste since the fruit is so sour. And secondly, with no commercial pectin, the sugar is needed to ensure the marmalade will set up. Then I processed it in a boiling water bath for 10 minutes. The results were a pleasant surprise. Sweet and tart and not very bitter, it was actually kind of delightful. I am hoping to try it in my tropical bar recipe the next time I need to bring a dessert somewhere. It would also be really good as a glaze over blueberry cheesecake, I'm sure! The holidays are over and that means one thing... time to get back to cooking from "Deep Run Roots". I've missed Vivian. It feels like months since PBS aired a new "Chef's Life" episode. I've had to resort to streaming earlier episodes, and I might have watched the Holiday Special more than once. In the interest of trying to eat seasonally (which is more for Nancy and Courtney, my co-conspirators who are in Virginia, and not for me, stuck on this tropical island where nothing I want to eat is ever in season except maybe mangoes, avocados, and coconuts) we decided to tackle the rice chapter. To be completely honest, it's not a chapter that spoke to me, although I was happy to see that 'Scarlett's Chicken and Rice' was included, since that's a dish that has come up several times on the show. Nancy chose the "Crispy Ginger Rice with Leeks, Shiitakes, and a Fried Egg" because she loves fried eggs. Me, not so much. Courtney chose the "Country Ham with Celery Creamed Rice." Being that there's no country ham to be found on this island, better her than me. And what did I go with? Happily, one look at the rice pudding recipe confirmed I had all the ingredients (well, except the rice, but more on that later) and so that's what I chose. I like rice pudding. But I never make it, because every recipe under the sun starts out with cold, cooked white rice. Which is a problem for me, because I never have white rice in the house, never mind cooked and cold. So I was excited to try this one, because you basically dump everything in the pot along with a half cup of UNCOOKED rice, and you're good to go. Can do. Now, I'm no rice connoisseur, so I began by reading Vivian's recommendations. Long Grain... Carolina, Jasmine, Basmati, Uncle Ben's. In that order. Well, I knew the odds of finding Carolina rice here would be nil, so off I went to the commissary in search of Jasmine rice. On an island where most inhabitants have Filipino, Japanese, or Spanish blood, there is no shortage of that. Y'all, my choices were a 5 pound bag or a 50 pound bag. I wanted to scream "What happened to the small 16oz packages? I only need a half a cup!" And then I wanted to cry because I just want to live where I can buy normal groceries. I've been here for over 18 months and I'm never going to adjust. I've accepted that. So I bought the 5 pound bag, sans tears, and went home to cook. 1. Give the cat some fresh water. 2. Pour the 5 pound bag of rice into an air-tight container to prevent insect infestations. 5. Wipe down the counters. 6. Wipe down the cupboard. 7. Discard the Christmas left-overs that are languishing in the fridge. 8. Put away all the spices that came crashing down while you were digging around trying to find the nutmeg. 9. Turn on the Roomba so at least you get clean floors out of the deal. 10. Feed your sourdough starter. At the end of 30 minutes, your pudding will still be soupy. Mine was REALLY soupy, because despite what the dial says, my burners only have two settings: warm and scorching. So I erred on the side of caution. After 10 minutes of cooling, it had significantly thickened. And dang, this stuff is good warm. It's so nice knowing that I can make rice pudding whenever I want, no cold, pre-cooked rice required. Which is a good thing, because I now have a lifetime supply of white rice. I had a happy surprise today in the garden, so I thought it was time to show you how things are growing out there. We are getting towards the end of rainy season, which means that we're still plenty wet. I love not having to water my containers, as it's unusual if we don't get at least a little shower once a day. Then the sun comes out and dries everything out. In the dry(er) season (Dec - May), we may go two or three days without rain, which means I have to keep up with watering the plants I have in containers because the sun is so hot that even though we'll still get a couple of inches of rain per week, it's just not enough. I bought this Barbado cherry when we first got on island a little over a year ago. It has blossomed several times, but not set fruit... so I was happy to see some growing. Once it gets going, it should produce nearly year-round. This was my truly happy surprise this morning: The Strawberry Guava that I bought at the same time as the Barbados Cherry is blossoming! I have been waiting and waiting for signs of fruit, and it makes me giddy to see the beautiful flowers. And we all know how I feel about my figs. They are looking beautiful! This is my green-stem Malabar Spinach plant. It's so long! I just keep weaving it between my railing posts and it seems to be loving life. We love the leaves in smoothies. This tomato was one of the volunteers I found that sprouted up shortly before I got back on island in August. It really started to take off once I repotted it. These are some sunflowers I planted from old seeds. I didn't expect any of them to sprout. I'll need to transplant them soon so they have more room! Lots of bees out doing their orientation flights this morning! The dragon fruit has really grown by leaps and bounds. This is a native yellow variety, and I've been told I won't need to hand-pollinate it. I just hope it flowers soon! I've got several Poona Kheera cukes that sprouted, so this one is on the same chain link with the luffa. I grew some in the dry season without much luck, so I'm hoping these will do better. I just cut back this lemongrass last month and it's already grown even more. This all started from a $1.69 bunch of stalks I bought at the commissary and rooted. And this prehistoric looking monster of a plant is called Naranjilla, which means 'nectar of the gods'. It has the nastiest thorns ever (which the Baker Creek catalog failed to mention) so I moved it from a pot on the deck into the pathetic raised bed. We'll see how that goes. And this lettuce is an experiment that seems to be doing well. It is Jericho Lettuce, which supposedly is more heat tolerant than most. I've had it in a protected place away from direct sunlight and it seems to be doing well. I would like to start some pepper seeds and see if I can't grow some jalapenos, but other than that, I don't have any major plans for the garden. It is definitely still an experiment in this humid 'paradise'. I am a Navy wife, mother of 2, and daughter of The Risen King. I love to bake, garden, and craft.